Skip rolled in just after 9am with a report of bluefish. He said if he didn’t have to leave for a prior commitment he would still be down there. When he got to the beach he could see the water bubbling a bit too far for casting to, and then they headed towards land. He couldn’t tell what kind of bait it was but they were definitely chasing something. From about 7am on, 3-5 pounders kept coming into shore, going back out, coming in, going back out……..you get the drift! Skip and some of the others were using top water lures with one report from Skip that a fisherman had two bluefish on one plug both on the back hook. Those fish are hungry! 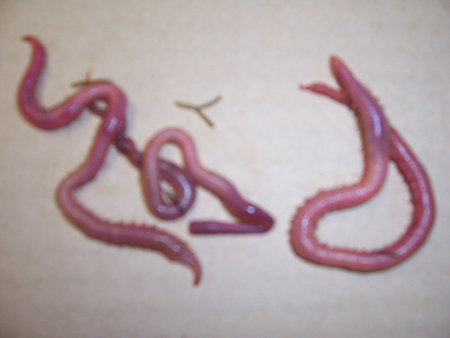 Justin was in this morning to buy another dozen worms. He was down yesterday, bought a dozen worms, and managed to catch and release 3 fish from a 25” to 32”. Justin was fishing the oceanfront on the refuge during the outgoing tide. Off the beach the blues were also hitting. The spots were south of te regular haunts, with most fish taken on swimmers in 30 feet of water between the Polio Camp and Emerson Rocks. It was windy as hell, and the chop was up to 3 feet. Cold but fun. We got a couple for the grill and a couple for the smoker. 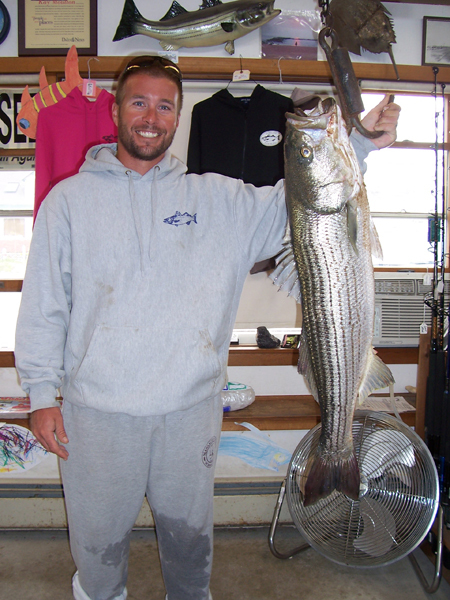 On September 11th, Andy Buck caught this 21.10 pound striper on the refuge using worms. 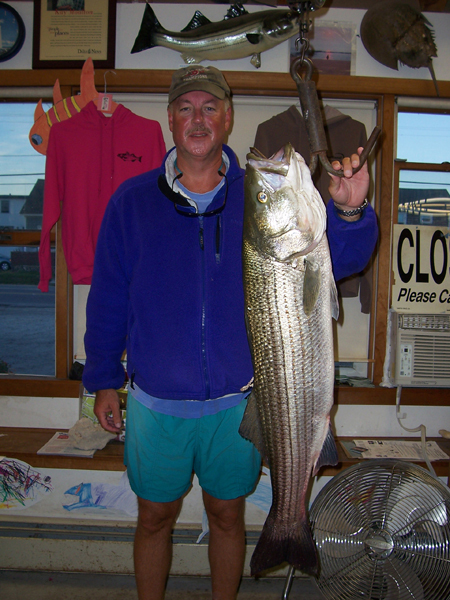 On September 12th, Doug Henderson from North Andover caught this 18.4 pound striper on the refuge using worms. This is a bloodworm. 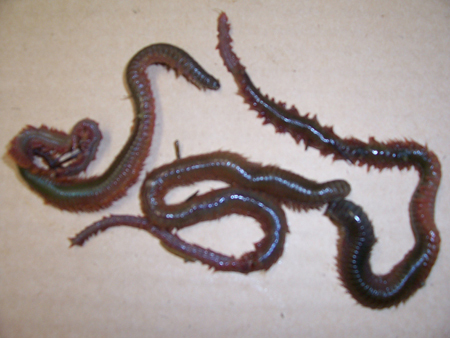 They look like an earthworm, BUT have a tube like thing that shoots out with 4 pinchers at the end. They are a bit tougher than a seaworm but most of the fishermen are afraid of them. RIGHT TALLJEFF???? Did you get bit today? This is a seaworm. They are the local favorite of most fisherman and only have two pinchers!!! We won’t lie. All lot of you are not having good luck out there, but we have had just as many come in and tell us how well they are doing. We don’t have the answers for you, but we do try our best to send you to a spot that we hope will produce your best bet! Spend your time along the oceanfront this time of year……………………………it is your best chance to have a school of bluefish “whizz” by you and to hook into a striper that may be heading south. Good to hear that Justin is finally catching some fish! How do I send catch and release foto? ohhhhhhhh thats not right..once you squeeze his face those bloods are fine. But when the stripers bite them, they slam them. got quite a few blues yesterday ( wed ). so much fun.!! GREAT REPORT BY THE WAY!! How is the dredge affecting the fishing? And is the beach on the reservation closed to fishing? So far the dredge isn’t operating. It’s just hooking up the pipes. No beach closures to date. Surfland admin rocks! Ty 4 the quick reply! 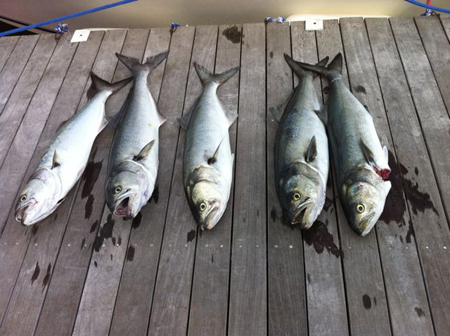 Thrusday Sept 16 fished lot 3 from 6am to noon and the blue fish were everywhere. They hit anything thrown to them. After catching over 30 fish, my wrist were too tired so I quit. …was in Ipswich Bay about 0700 Wed., the 15th, headed over to Rockport to pull my traps, when all hell broke loose w/ bluefish blitzing, pretty much here, there, and everywhere. A nice 8 or so pounder upchucked a half dozen whole, three inch shiners as soon as I boated him, so that’s what was causing all the fuss. Things quieted after 1 1/2 hours or so, so I went on my way. The wind and water had kicked up pretty good by the time I returned on the way back, and the blitzing had stopped.